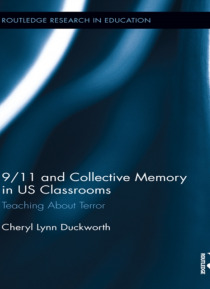 While current literature stresses the importance of teaching about the 9/11 attacks on the US, many questions remain as to what teachers are actually teaching in their own classrooms. Few studies address how teachers are using of all of this advice and curriculum, what sorts of activities they are undertaking, and how they go about deciding what they will do. Arguing that the events of 9/11 have b… ecome a "e;chosen trauma"e; for the US, author Cheryl Duckworth investigates how 9/11 is being taught in classrooms (if at all) and what narrative is being passed on to today's students about that day.Using quantitative and qualitative data gathered from US middle and high school teachers, this volume reflects on foreign policy developments and trends since September 11th, 2001 and analyzes what this might suggest for future trends in U.S. foreign policy. The understanding that the "e;post-9/11 generation"e; has of what happened and what it means is significant to how Americans will view foreign policy in the coming decades (especially in the Islamic World) and whether it is likely to generate war or foster peace.